Elkann: FCA discussing merger with GM and other players. TURIN (Reuters) - The chairman of Fiat Chrysler Automobiles, John Elkann, today confirmed that CEO Sergio Marchionne had sent an email to General Motors about a possible tie-up. Elkann said discussions had taken place with other players as well. The New York Times on Saturday reported that Marchionne had sent an email to GM CEO Mary Barra in March suggesting that the two companies combine. Marchionne said on Thursday he could not confirm the report. He said he writes "lots of emails." "It was not the only email, it was not the only conversation," Elkann told reporters today when asked about the New York Times report. Marchionne's email suggested a merged GM and Fiat Chrysler would save billions of dollars in costs and create an automotive giant, according to the paper. The idea of a merger did not interest Barra or any other GM executives, the report said. Asked if Fiat Chrysler would consider a hostile bid for GM or other players in the sector, Elkann said the company would "act with determination if there are the prerequisites to do something that makes sense," without giving any details. Marchionne last month publicly made a call for shrinking the number of players in the global auto industry to sustain the heavy capital investments needed to meet demands for cleaner, safer vehicles. 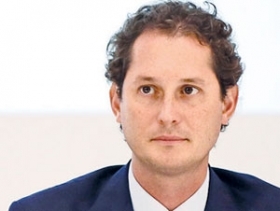 Elkann, the scion of the Agnelli family that controls Fiat Chrysler via its Exor holding company, said he fully supported Marchionne's call for consolidation, which he hoped would spark a debate within the industry. He said he had "no doubt" that consolidation in the sector would happen, but declined to comment on an ideal partner for Fiat Chrysler or other possible combinations within the sector. Elkann said his company had "very good prospects" given Fiat's merger with Chrysler, and the new models it has been bringing out as part of a five-year investment plan that aims to increase annual sales to 7 million vehicles by 2018. Elkann reiterated Exor would be open to diluting its stake if it meant boosting the carmaker's fortunes. "Exor and my family ... will not be an impediment to a good transaction for FCA," he said. Reuters reported in April, citing sources familiar with the situation, that Marchionne was hoping for a big deal, possibly in the United States, to plug the carmaker's weaknesses and cement his legacy before stepping down in early 2019. Marchionne and Fiat's founding Agnelli family are showing particular interest in GM, sources told Reuters at the time, after the U.S. carmaker's move to tie up with France's Peugeot failed. The world's seventh-largest carmaker may have trouble finding a partner. Its debts rank among the highest in the industry, it barely breaks even in Europe and it is expected to burn cash for years. It is also smaller than most rivals. FCA's stock market value of $20.69 billion is far below GM's $58.48 billion and Volkswagen's 106.6 billion euros ($117 billion), ThomsonReuters data shows. It may be able to persuade smaller companies like Peugeot , whose market value is 15.08 billion euros, to talk, though a key obstacle to any combination would be the issue of closing factories in Europe to achieve cost savings. Peugeot chief Carlos Tavares was quoted saying earlier this year it was too early to talk about a merger, wanting to focus on his own recovery first. Nonethless, Marchionne has repeated calls for shrinking the number of players in the global auto industry to help sustain the heavy investments needed to meet demands for cleaner, safer vehicles.